Click Here to claim your PokerStars New Jersey $30 bonus! PokerStars New Jersey received a license to operate from the New Jersey Department of Gaming Enforcement in September 2015 and launched to New Jersey online poker players in March 2016. Canadian gaming company Amaya currently owns PokerStars New Jersey. It operates in New Jersey through a licensing agreement with Resorts Casino, Atlantic City. PokerStars had, without a doubt, the most anticipated site launch in the history of US regulated online poker. Before 2011, PokerStars was the largest nationwide online poker site, and it remains the largest site internationally to this day. PokerStars’ first-time player bonus: Make a deposit of $20 and use PokerStars NJ bonus code FREE30 and get $20 cash on PokerStars NJ plus $10 in Spin & Go tickets. New depositing players will also receive a $5,000 depositor freeroll tournament ticket, and one million play money chips. PokerStars offers a deposit bonus of 100 percent up to $600. Simply make a minimum deposit of $10 using code STARS600 to receive the bonus. Please note that PokerStars allows players to claim the full value of this offer over their first three deposits by for example claiming $100 on their first deposit, $300 on their second deposit, and $200 on their third deposit, for a maximum of $600. These bonus funds are subject to a release requirement of 100 VIP Player Points per $10, which translates to a whopping 55% rakeback – the best offer in all of New Jersey. The site is known for hosting a flock of monthly promotional events, most of which are designed with the casual player in mind. The typical PokerStars promo tasks players with completing a simple daily challenge, either at the cash game or Spin & Go tables. Players are rewarded with a randomized cash prize, generally ranging in value from a dollar or two, up to a four or five figure score. Milestone Hand promotions, targeted Spin & Go events, and reload bonuses are also fairly common on the site. The bonus amount is independent of the free $30 players will receive for making their first real-money deposit of $20. This means that players can capitalize on both. PokerStars' entrance into New Jersey was the most highly anticipated online poker launch in a while. And rightfully so since PokerStars is an internationally successful online poker and casino company. Known for its monthly promotional events and variety of tournaments, PokerStars has a strong following. However, due to population constraints, it doesn't offer as many games as its international site. Its popular software and high-quality mobile app make it an easy and playable online poker site in New Jersey. – Cash Game Surprises (April 15 – May 1): play at any cash table from 19:00 to midnight ET daily for a chance to win special Chests with random rewards. – Milestone Tournaments (April 15 – May 1): participate in qualifying MTTs, get lucky, and win free tickets for $20 and $200 tournaments. – Daily Rewards (April 15 – May 1): play at least one hand of real money poker on each promotional day to earn Rewards Chests with guaranteed rewards. – 200 Billion Hands (April 15 – May 1): get dealt into hand number 200 Billion and get an instant $10,000 bonus. 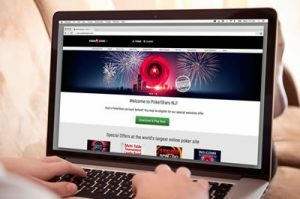 PokerStarsNJ.com officially launched in New Jersey on March 21, 2016. Former PokerStars players can use their previous username. The associated password will log into the New Jersey client. New players will be able to easily create an account within minutes. PokerStars awards existing players with a higher VIP status and StarsCoins, the new name for FPPs. Past play will determine what players receive. The international PokerStars client is without a doubt the favorite among players, and PokerStars has brought a nearly identical version of that platform to its NJ gambling site. In 2014, PokerStars released a new version of its platform. PokerStars version 7 has many new features, including filters to sort and save players favorite games and tables. The new update refined how leaderboards are calculated and optimized many animations and graphics. How easy is it to play on PokerStars New Jersey? PokerStars allows players with accounts at the site prior to Black Friday to log in to the site with the same username and password. New players should be able to create an account in minutes. Gameplay on PokerStars’ software is exceptionally smooth, and server issues impacting ability to play are extremely rare. In fact, the international site regularly draws hundreds or even thousands of players for individual tournaments, including 6,000+ players for its $215 buy-in Sunday Million. At times, hundreds of thousands of players are online at once. Even with this enormous strain on their servers, the site operates reliably and with almost no downtime other than scheduled maintenance during off-peak hours. Due to population constraints, PokerStars New Jersey does not quite offer as many games as the site does in the rest of the world. Hold’ em games include, no limit, pot limit and limit. Stud games like seven-card and razz. Draw games like five-card draw, triple draw and limit badugi. Mix games including HORSE and eight game. Available stakes range from micro to high. One of the biggest differences that separated PokerStars from its competition throughout the history of the company is the variety and size of tournaments it offers. The company holds a world record for largest poker tournament ever with 225,000 players for a one-dollar buy-in tournament with a prize pool of $300,000. PokerStars also holds a world record for largest ever online poker tournament prize pool. The record occurred at the 2010 WCOOP. The prize pool was worth $12.2 million. This has only ever been exceeded by live events. While the site does offer some sizable guarantees relative to the New Jersey market, it would be impossible for prize pools to match what they do in the rest of the world. That being said, PokerStars has pushed the envelope in New Jersey with guarantees reaching as high as $200,000. Using the Contact Support Form available in the Help section of the PokerStars NJ website. What else is interesting about PokerStars NJ? Rewards! The market on this front is tough in New Jersey, but PokerStars has typically won the player rewards game compared to its competitors in other countries. Part of that may be related to its ability to pay back a higher amount of rake in player rewards because so many players are on the site, however. Cash rewards: Redeem VPPs for cash in denominations of $10, $25, and $100. VIP store: Players can save VPPs and redeem them for gifts in the PokerStars’ VIP store. Gifts range from apparel to electronics like computers and tablets. VIP tournaments: Players can use StarsCoins (once known as FPPs) to enter exclusive PokerStars tournaments. The more exclusive a tournament, the more FPPs needed. Players at PokerStars across the world can earn points and achieve up to six VIP club levels. BronzeStar: This is the entry level. Players begin earning points to be utilized for rewards. ChromeStar: Access to double benefits and rewards. SilverStar: Accelerated StarsCoins earnings and extra rewards. GoldStar: Increased rakeback rate of up to 21 percent. PlatinumStar: The highest monthly tier offers 22 – 24 rakeback, and access to VIP Bash Satellites. SuperNova: Reserved for the most dedicated grinders, with annual tier offers players the site’s highest rakeback rate, as well as a slew of other luxuries. This program allows players to earn between 9% and 28% rakeback. A sprinkling of news has made its way out regarding this year’s SCOOP tournament. The 2019 Spring Championship of Online Poker will kick off on May 12th and run for 14 days, closing out on the 26th. If last year is any indication, you’ll be seeing over $65 million in guarantees throughout the tournament, including a daily tournament with $1+ million in cash prizes. While we don’t have all the details yet, we do k now that you’’ be able to start playing satellites on April 15th.